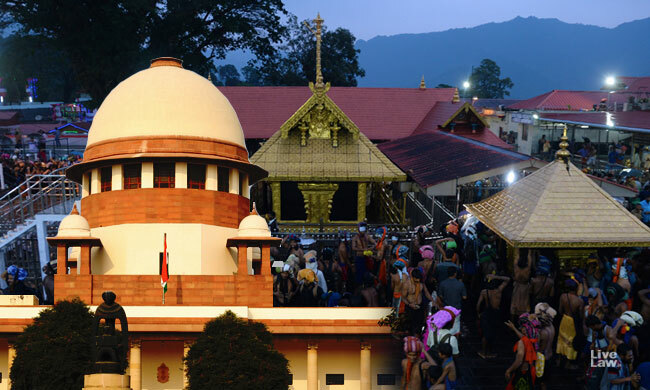 Today, the Constitution Bench of the Supreme Court started hearing the review petitions against the September 28 judgment in the Indian Young Lawyers Association case, which declared the right of women of all age groups to visit Sabarimala. Listed before the bench of CJI Ranjan Gogoi and Justices Nariman, Khanwhilkar, Chandrachud and Indu Malhotra were 55 review petitions filed by various parties. Senior Counsel K Parasaran started the arguments. He invited the bench's attention to the fact that 'religious places' are conspicuous by their absence in Article 15(2) of the Constitution, which declared the right of all persons to access public places without any discrimination. The Constitution has deliberately kept out religious places from the purview of Article 15(2), and confined its application only to secular places. He also submitted that attempts to amend the constitution to include religious places within Article 15(2) met with no success. Though this point was raised during arguments, the judgment has not addressed it. The non-consideration of this aspect constitutes an "error apparent on record" of the judgment, warranting a review, submitted Parasaran. He further submitted that the judgment erroneously imported the concept of "untouchability" under Article 17 to the situation of Sabarimala temple, without understanding its historical context. "Untouchability will apply only if someone is treated less than a human being", he said. The exclusion of women in the age group of 10-50 years from Sabarimala temple is not based on caste, but based on the character of the deity, which is that of "naisthika brahmachari", a permanent celibate. At this juncture, Justice Nariman interjected to say that the judgment was not based on Article 17 alone. Parasaran referred to Bijoe Emmanual case, where the SC held that Courts should not test the rationality of a religious practice, unless it is so abhorrent or criminal. Next was the turn of V Giri, senior counsel appearing for the thanthri, the chief priest of the temple. Thanthri is regarded as the father of the deity, and has special rights to preserve the essential character of deity, he said. He further advanced that right to worship under Article 25 has to be exercised in consonance with the essential character of the deity. "Every devotee cannot question the essential practice of a temple" ,he said. He seconded Parasaran's arguments that the practice was not based on caste, but on the character of deity. He also criticised the invocation of the concept of "constitutional morality", which he termed as having no textual basis. It was evolved by judges recently, he said. He also said that none of the petitioners claimed to be devotees of Lord Ayyappa. After that Dr. Abhishek Manu Singhvi, appearing for the former Chairman of Travancore Devaswom Board, Prayar Gopalakrishnan started arguments. He said that Court erred in holding that a practice cannot be regarded as essential practice, if it has no universal application. "In a diverse religion like Hinduism, one cannot look for universality. This test applied in the judgment is not correct", he said. In Hinduism gods are worshipped in various forms and manifestations. In Sabarimala, the deity is worshipped in this particular manner. He also adopted the arguments of Parasaran and Giri that the practice was based on the nature of deity. Only the judgment of J Indu Malhotra took into consideration the naistika brahmachari character of the deity; other judgments merely made a passing reference to it, he submitted. Regarding the test of constitutional morality, he said that it is based on "external subjective considerations". "Many aspect of faith will be irrational. But it is not a science museum but religion. So constitutional morality should not be applied in all of it. Courts should be very careful while applying constitutional morality in matters of religion", Singhvi advanced. Shekhar Naphade, senior advocate appearing for Sabarimala Achara Samrakshana Samithi, submitted that the effect of the judgment was a direction given to a religious community that they should not hold a belief. This is an internal affair of a religion. Unless there is a criminal law which forbids a practice, Courts cannot interfere. The belief is party of the collective conscience of the community. The community has not accepted the Court's judgment. "The community alone can decide whether centuries' old belief should be changed or not. Few activists cannot get to decide that", Naphade said. R Venkatramani, senior advocate said that there was an apparent contradiction in the judgment, as it allowed the claim of petitioners, who do not believe in a ritual, to change it. "Either you believe in a ritual or opt to not become part of it. You cannot seek to become a part of ritual by questioning its basis", he said. Courts cannot split faith into permissible faith and impermissible faith, submitted Senior Advocate Venkatraman appearing for People for Dharma. It was also pointed that the factual findings entered by Kerala HC in 1991 that the custom amounted to essential religious practice have not been challenged, and hence was binding. Mohan Parasaran submitted that the Court erred in not treating Ayyappas as a religious denomination. "Merely because persons from other religions worshipped Ayyappa, it cannot be held that they do not form a religious denomination", he said. J Sai Deepak, appearing for Pandalam royal family, submitted that naisthika brahmacharya, which is one of the several forms of brahmacharya, mandated maintenance of distance from the opposite gender.